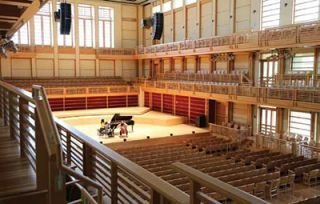 The Donald and Maureen Green Music Center is a world-class performing arts complex in the heart of Northern California’s renowned wine country. Located on the campus of Sonoma State University, the Green Music Center (GMC ) consists of multiple performance venues, a music education wing, sprawling outdoor spaces, an onsite restaurant, and more. The Joan and Sanford I. Weill Hall’s new system comprises a total of 18 KARAi two-way enclosures, nine per side, flown above the stage, with a pair of L-Acoustics ARCS WIDE enclosures on each side to cover the left and right seating areas, plus four ARCS FOCUS enclosures addressing the rear seating area. But the heart of the $145 million GMC is the architecturally impressive Joan and Sanford I. Weill Hall. Opened in the fall of 2012, the concert hall seats 1,400 in an audience geometry that extends from the classic shoebox design with surrounding balconies to the sides and rear of the stage. Furthermore, the entire rear wall of the hall opens to a massive lawn that can seat more than 5,000 additional guests when the need arises. When looking to install a new sound reinforcement system, the University’s challenge was to find a solution that would enable the hall to host not only the classical performances that its acoustics are designed for, but also to provide exactly the right amplification for the wide variety of non-classical artists who perform there, including Ben Harper, Jason Mraz, Lyle Lovett, and Stewart Copeland. In addition to that challenging goal, however, the system also had to extend to audiences seated outdoors and do so seamlessly, so that the SPL and tonality remained consistent as a listener walks from the rear of the hall to the middle of the lawn. Several sound systems were considered to accomplish that immense task, but only one succeeded: L-Acoustics’ KARA modular WST line source, complimented outside by K2. Designed and installed by the U.S. branch of AV systems integrator Solotech, the hall’s new system comprises a total of 18 KARAi two-way enclosures, nine per side, flown above the stage, with a pair of L-Acoustics ARCS WIDE enclosures on each side to cover the left and right seating areas, plus four ARCS FOCUS enclosures addressing the rear seating area. Rounding out the venue’s interior coverage are a total of 19 5XT ultra-compact coaxial enclosures used for stage-lip fill and box-seat (parterre) areas, as well as four SB18i subwoofers stacked on the stage. The hall system is powered by four LA8 (4 x 1800W) and two LA4 (4 x 1000W) amplified controllers. Auerbach Pollock Friedlander in San Francisco has a long working relationship with Sonoma State University and provided oversight and system design specification for the venue’s lawn system, which was also installed by Solotech. Patrons outside the hall hear performances through 22 L-Acoustics K2 line array modules, configured in two hangs of 11 enclosures each, complemented by a central Constant Curvature array of six ARCS II for near-field coverage. LF is delivered via eight SB28 subs set four per side, while a dozen LA8 drive the entire lawn system. As the range of music broadened to give the hall wider appeal and use, the need for a sound system that could support such an extensive palette became crucial. A side-by-side comparison of three systems was arranged and it quickly became clear that only one system could meet the concert hall’s complex requirements. “In addition to the extended coverage, we were looking for a system that we could apply even to acoustic performances,” said Uhlig, noting that adding just a light touch of amplification to classical instruments brings clarity to performances. “The L-Acoustics speakers have the dynamics and the sound quality to add real fidelity to live sound that other speakers just cannot provide.” He related that even such luminaries as cellist Yo-Yo Ma and violinist and conductor Itzhak Perlman, at first reluctant to have their performances played through the PA, came to agree that a light touch of amplification allows every audience member to experience a performance intimately, offering completely natural sound which has utmost clarity and definition.